Current Futures Studies Master’s students visited the Prime Minister’s Foresight Unit. Click here for more…. Turun yliopiston tulevaisuuden tutkimuskeskuksen maisteriopiskelijat kävivät vieraamanne kuulemassa ja keskustelemassa kansallisesta ennakoinnista ja ennakointiverkostosta, jota me VNK:ssa ja Sitrassa koordinoimme. Vanessa Deggins kirjoitti visiitistä opiskelijoiden Black Swans blogiin ja julkaisemme tekstin nyt myös tässä. Kiitos mainiosta vierailusta! At the end of April, I along with other Master’s Students from the Futures Studies program visited the Finnish government’s foresight unit in Helsinki. It consists of specialists from the Prime Minister’s office and Sitra, The Finnish Innovation Fund. The National Foresight Network is a mostly online forum of Finnish organizations that are active in foresight. Online forums and social media are used to engage citizens, businesses and other actors who may have valuable input. There is also an annual FinnSight Forum where government officials and foresight specialists come together to discuss various issues in preparation for the government’s annual report on the future. On the regional level, each of the 19 regions in Finland have at least one person working on foresight as part of a council that focuses on the areas specific interests and issues. We started by introducing ourselves to our hosts and what future trends we were interested in. This ranged from education to renewable energy to artificial intelligence. Next, there were two presentations, the first from Kaisa Oksanen, a senior specialist with the Prime Minister’s Office. Kaisa explained the national foresight process for Finland and her unit’s role. They are able to work independent of parliamentary influence but their work is made available to them. Some reports include sustainable growth and its contributions to quality of life and the future of work and working life in Finnish society. They also hold workshops for civil servants to help them understand foresight and to develop a future oriented mindset in their policy decisions. One new trend Kaisa said they are working on is focusing on using experimentation in the decision making process and trying to encourage members of Parliament to take a more evidence-based approach to their work. The next presentation was from Elina Kiiski Kataja, a foresight specialist with Sitra. She discussed one of Sitra’s most recent reports on the Future of Democracy. She explained that it is a system that hasn’t necessarily adapted much from it’s initial processes almost 100 years ago. This has lead to “democracy fatigue’ which is characterized by lower voter participation due to disillusionment or feelings of disconnection from elected officials. Key to fixing these issues, she said, is new methods of operation to bring about greater inclusion. These issues, it is believed, have lead to the rise in far right parties and populist politicians in many European countries and the United States. Specific examples include Donald Trump’s election in the United States and the United Kingdom leaving the European Union, which were not predicted by the current political models. Part of this change will be reconciling the differences and seeming conflicts between representative democracy and futures thinking, both of which Elina feels are important for any move forward. Her article on the topic chronicles Finland’s representative structural changes since the 19th century. It has changed from the House of Estates, mostly aristocratic, to a representative democracy brought in by the Industrial Revolution and the rise of a large working class population. As the country has moved away from an largely industrialized society, the key is to figure out what will be the next class or estate that defines the next composition of society and future form of administrative authority. (opinion) I found the visit very thought provoking as I am interested in how technology has disrupted and continues to disrupt not only society’s standard practices, but some structures of inequality that have been maintained throughout society for a very long time. The other side to this are the people who feel left behind because of the technology. These of course, are the people who are and have been losing jobs to automation, which is projected to continue. The bright side to this is that many jobs will also be created because of automation and I think key to this is to try to find a place for those who feel left behind. A hurdle would be people who don’t want to adapt to fit into these changes. We are all human after all. Another possible negative, as has been seen throughout the entire world, are outside forces, mainly politicians, using these issues to further ulterior motives that have had dangerous consequences. There is no silver bullet of course, and any plan to move forward will require changes on many different levels. 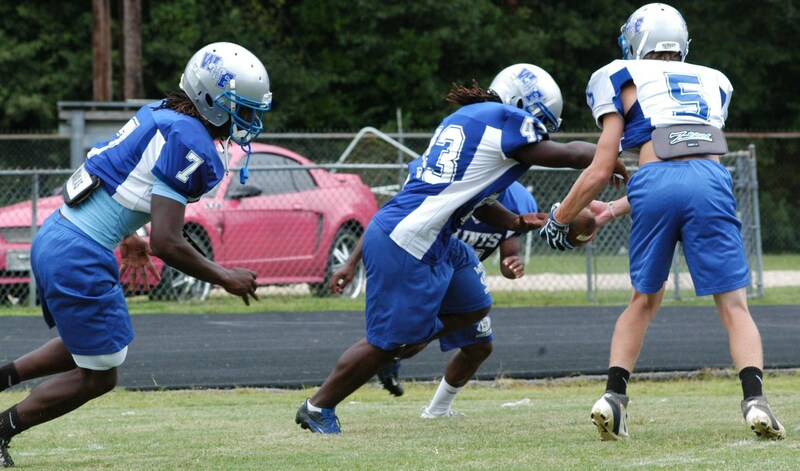 The 2013-2014 season isn’t a rebuilding year, but East Feliciana football coach Cedric Anderson said a lot of players will have to step up to fill in for graduating seniors. Senior wide receiver and cornerback Danny Johnson said they are taking a bottom up approach in that they are making sure the freshmen and sophomores also understand the importance of leadership and teamwork. Along with going to camps at the University of Alabama and LSU, Johnson said he was focused on helping his fellow tigers gel as a team. “I’ve been really leaning on Danny, Darryl Matthews (wide receiver), Kameron McKnight (running back) and Tyquincey Kilbourne (linebacker) to pick up the slack and see how far they can take us,” Anderson said. The Tigers finished last season 8-4 with a 14-16 loss in the Class 3A state semi-finals to Notre Dame of Crowley. East Feliciana is now in Class 2A, District 6. Anderson said he considered the season a success and he plans to take the same approach this year. Anderson said those losses, including a tough 12-19 loss to Salmen of Slidell prepared his guys for the playoffs. “I really saw that in the quarterfinals against Union Parish. We went into the fourth quarter 16-0 and the kids were able to reflect back on those tough early losses and get that win,” Anderson said. The Tigers went on to beat the Farmers 22-16 to get to the semis and face Notre Dame. Anderson said along with Notre Dame being a really good team, they also took advantage of the Tigers’ turnovers to get the win. McKnight, a senior and outside linebacker, said he is really looking forward to playing Zachary again this year. “They are a good team and they’ve beat us two years in a row,” McKnight said. He said their downfall last year was that morale started to drop after referees made multiple play calls that they didn’t agree with. Anderson said he had a good turnout for summer two-a-day practices in June and July, which consisted of lots of weights, conditioning and speed drills. This season’s schedule will feature non-district games against West Feliciana, Belaire and Zachary before starting district play. West Feliciana football coach Robb Odom said continuing to improve on the little things is what will push his guys farther into the play-offs for the 2013-2014 season. “I think we did good this last season and I’m looking to build on that,” Odom said. Senior linebacker Seth Sterling said this season he will be better at knowing his assignments for tackles. “The Combine in Denham Springs was really helpful because I got to see the competition. I also improved on my time in the 40 (meter dash),” Sterling said. Sterling said he wants the Saints to be a dominant defense this season and he plans to do a better job on seeing certain plays coming. He also would like to get a couple of turnovers or an interception and hopes to make first-string all-district team. The Saints finished the 2012-2013 season at 7-4 with a 49-22 loss to North DeSoto in the first round of the Class 3A District 6 playoffs. They opened last season with four straight wins before losing to Zachary 36-21. The Saints followed that up with three straights wins, which included district rivals Baker and Glen Oaks. The North DeSoto lose came after loses to Parkview Baptist and East Feliciana, who are not in their district this year. The Saints will still see the Tigers in their first regular season game. “We started out good last season, but it hurt us when bigger teams like Zachary and Parkview came. I think we have to work on not shutting down when we lose one,” said senior defensive end Logan Biggs. He said he and his fellow linemen have been working together after practice on technique and form. Senior running back Trè Bailey said they have to take it one game at a time, since they will still be playing against bigger schools. Parkview Baptist will be the Saints last regular season game. “We spent the summer in the weight room and linemen and running backs have been helping each other a lot with our form and blocking,” Bailey said. Senior tight end and linebacker Tevin Johnson said he is hoping for a good season after being sidelined last year with a torn ACL. “We only had four seniors last year, so almost everyone is back. We are healthier and deeper this year,” Johnson said. Johnson said he began light jogging, then moved to stadiums early in the summer and hopes to make an impact. “We have Port Allen and University High in our district now, so it will be a real test against both of those teams. 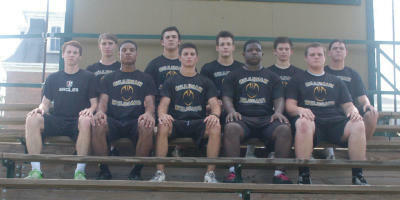 We’ve all been pushing each other and this will be a good season,” Johnson said. The Saints first regular season district game will be against Port Allen on Sept. 27. Silliman football coach T.J. Davis said he’s looking for steady improvement from his players this year. “We’ve had two first round losses in the last two years, so our goal right now is to get past that first round,” Davis said. The Wildcats ended last season at 6-5 with a 27-12 loss to Trinity Episcopal Day School (Natchez, Miss.) in the first round of the Mississippi Private School Association district playoffs. They began last season with a loss to Brookhaven Academy, then had three straight district wins before losing to Centreville Academy and Trinity Episcopal Day. “We had a talented team, but they didn’t gel like I thought they should have,” Davis said. Many returning players echoed their coach. Senior corner back and wide receiver Tabary Cucullu said they worked really hard as a team over the summer. “Coach had us running a lot and we did a lot of seven-on-seven drills to make sure we are playing as one unit and really got to know our plays,” said Cucullu. “I felt like I got a lot of help from the seniors last year,” said junior defensive end Jordan Talley. He ended the season with 107 tackles overall, 17 sacks and 26 tackles for a loss, according to Talley. He said he spent most of his summer in the weight room with his teammates, trying to get stronger. Going into the season, Talley said he feels he still needs to improve his tackling technique and for the team to come together. Senior wide receiver and corner back Collen McDowell said summer football camps helped him. “Last season, I feel like mentally I hit a wall as far as picking up on plays and different techniques,” McDowell said. He said he learned how to cover people better and loosen up. “I was really over thinking a lot of stuff last year,” he said. Senior running back Todd Bourgeouis said spent the summer doing some make-up work after missing two games because of a concussion. He said his time at the Manning Passing Academy helped him improve on his footwork in the backfield. Junior lineman Jozie Milton said the team is focused on a state championship this year. He said the team practices have brought them together more. “If somebody messed up, we used to just jump on him and yell at him. Now we make sure they understand where they were supposed to be and make sure they get it right next time,” Milton said. Milton said he finished last season with 97 tackles, 7 sacks and 4 fumble recoveries and said he and Jordan Talley will kind of compete to see who gets the most tackles. Their first regular will be against Oak Forest Academy on Aug. 23. Zachary football coach Neil Weiner said he was pleased with his players’ effort last year but would like to see his Broncos make it past the first round of the playoffs despite a challenging 2013-2014 schedule. Weiner described last season as up and down and said his players came home with some big wins but came up short in the playoffs after getting “pushed around on defense a bit” by Acadiana High School, who beat them 63-42 in the 5A, District 4 playoffs. The Broncos finished last season at 6-5. During the season, they handed Dutchtown its first regular season loss since 2009 and beat East Feliciana in overtime. Junior quarterback Keon Brown shared his coach’s sentiments. “My only goal for the season really is to help the team get past the first round of playoffs,” Brown said. This will be his first year starting at quarterback, so Brown said he spent his summer honing the fundamentals of his position, such as reading defense and throwing accuracy. Senior offensive lineman Terry Minor has played all four years, but this will be his first year as a starter. He said he and his teammates having been working to fix the mental breakdowns he saw during the end of the season. Minor said he thinks the scrimmage against West Monroe and the jamboree game against West Feliciana will be a good way to see how quickly he and his teammates can adjust to different teams strategies. Senior running back and free safety Forrest Town said the Broncos also need to focus on consistency. “We definitely played well as a team last year, but I think we became a bit lackadaisical toward the end of the season and lost a couple of games we should have won,” Town said. Town said he thinks staying consistent deep into the season will help them when going into the playoffs. Along with getting stronger, Town said he and the defense have been working on better recognizing offensive plays. The Broncos with play Byrd High School on Sept. 6 in Shreveport. 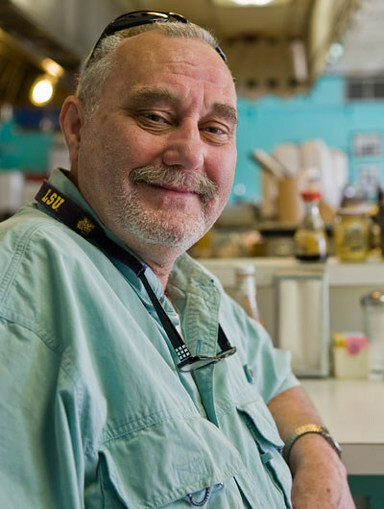 Ask any former or current LSU student about Louie’s on State Street and they’ll tell you about their favorite omelet or style of hash browns. But along with their favorite dish, they may also have a story about Frenchie Cox, the daytime line cook. No matter how busy he is, Frenchie somehow manages to greet everyone entering the diner. If you’re a regular, he will greet you by name, with a joke or an inquiry about work, family, or other tidbits you shared with him in the past. “The regulars are like family. They’ve been coming here for so long, and now then they bring their family,” Cox said. “I like the close contact because the place is so small.” Standing along the flat top, Cox regularly carries on conversations with nearby tables without raising his voice. Cox was born in Marksville, La. and raised in Mansura. After graduating from Mansura high school, he thought he would follow his father into law enforcement. “But then I discovered girls,” Cox said. While he was a student at LSU Alexandria, the Vietnam War started. Cox was drafted and served in the Air Force. He doesn’t really talk about his time in the service. After the Air Force, Cox said he traveled around the country, working many odd jobs before settling in Baton Rouge in 1987 to do what came naturally to him – cooking. Now he says every morning is a challenge. “You don’t know who’s going to come in, how busy it’s going to be,” Cox said with a smile, continuing to move along the line. 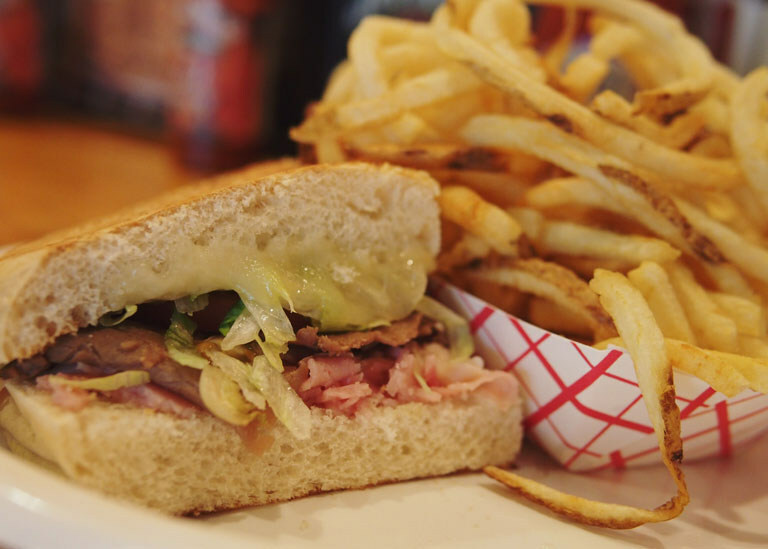 Regular diners have fond memories of their time with Frenchie. WRKF host Jim Engster has breakfast at Louie’s almost every morning before his talk show. He has had Frenchie on the show three times and describes him as a remarkable guy. “He’s talked about his mama, his military service, and being from the same town as Edwin Edwards,” Engster said. He also called Frenchie a hero, which the cook took issue with. “He just has me on when he needs a rating boost,” Cox said. Frenchie turns 60 on April 12. He will mark his 25th year at Louie’s the following month, and said he plans to cook as long as he is alive. Jacob Couvillion is bringing his family tradition to Baton Rouge. 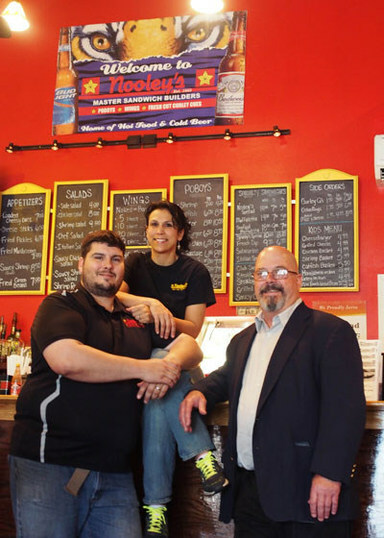 Last year, he and his wife Charmin opened Nooley’s Restaurant in Prairieville, rekindling a business his father Johnny ran until 1999. Jacob Couvillion, Charmin Couvillion and Johnny Couvillion. About two weeks ago, Couvillion partnered with business associate Charles McClaren to open Nooley’s at Game Day Daiquiris, which is just off College Drive. From 11 a.m. to 9 p.m., Game Day offers most of the Nooley’s menu and operates as a sit down restaurant and daiquiri shop. “We had been open as a daiquiri shop for about three years, and when I decided to sell food I really didn’t want to have the generic bar menu, so I sought out someone with quality food and name recognition,” McClaren said. “About eight months ago, he approached me with the idea to bring the menu here, but I wasn’t really ready to move forward since me and Charmin had just opened the restaurant,” Couvillion added. Once they got the Prairieville location going, Couvillion said he was ready to move forward with a Baton Rouge location. “My wife still pretty much runs the Prairieville store and I’m here [in Baton Rouge] in the afternoons,” Couvillion said. He had missed the restaurant business. “I was 21 when my dad got out of the restaurant business, and I just missed it. I’d see people and they would tell me they missed the food. It was always in the back of my head,” Couvillion said. For almost two months, he said he noticed a vacancy in a small shopping center near his house on Highway 44. “It was a wing shop that had shut down and I would always wonder what was the deal with it,” Couvillion said. He continued by comparing his next experience to that of Kevin Costner’s character in Field of Dreams. The morning after LSU lost the BCS Championship to Alabama was his turning point. He said his mind was racing as he left the property. That was January 10 of last year. The Prairieville location opened on April 28. “It was a crazy opening because people still remembered the name. We are doing good, which I worried about because we aren’t on the main drag in Prairieville,” Jacob Couvillion said. Couvillion said he is no longer in a rush to expand. Right now, he is focused on consistency. Nooley’s at Game Day is located at 4619 Bennington Dr.